Material: Forged alloy steel with minimum tensile strength of 180,000 psi. Finish: Black Oxide Finish for corrosion resistance, * Also available in a wide range of plating - e.g Cadmium, Titanium-Cadmium, Nickel, etc. All dimensions approximate variations do not effect use or design factor. For load ranges of 50,000 to 250,000 lbs. refer to our Safety Engineered Hoist Rings. 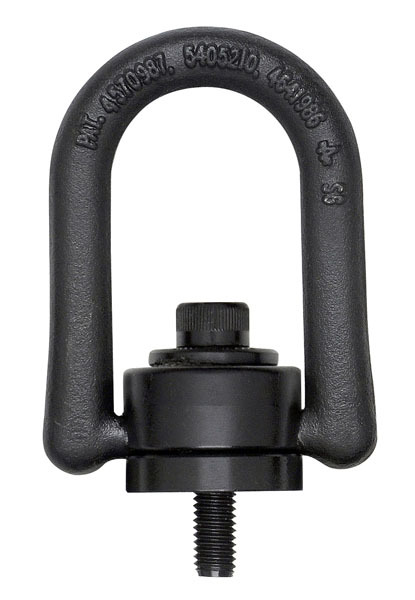 Heavy Duty® Hoist Rings are completely interchangeable with Safety Engineered Hoist Rings.